Vote count matches Republican Party exit polls but not the Democratic Party exit polls. Article first published in OpEdNews.com on March 10, 2016. 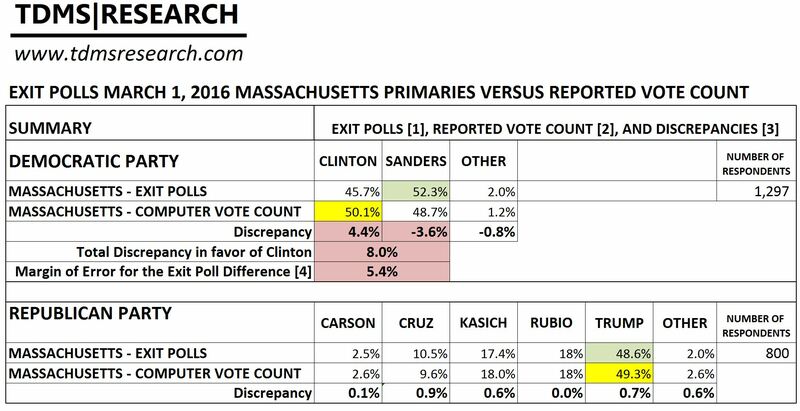 In the Massachusetts March 1, 2016 primary Democratic Party race, the computerized vote count declared candidate Clinton the winner but the exit polls indicated candidate Sanders to be the winner by a margin of 6.6%. These same exit polls accurately predicted the results of each and all of the Republican candidates. Until the US joins a long list of many other countries that protect the integrity of their elections through publicly observed hand counting of paper ballots, our elections are liable to be suspect. Exit polling has been performed in the US and other countries for decades and the science and proper methodology is well established to obtain an accurate prediction of the final vote. For years, many researchers have pointed to the discrepancies between exit poll results and the unverified computer counts in US elections. The main response by the defenders of computerized voting, while expressing blind faith in the unverified computer counting, has been to claim that the exit polls may go wrong because respondents, more enthusiastic for a particular candidate, would be more likely to agree to be polled. The recent Massachusetts Super Tuesday primaries did not support this theory. The Republican Party primary race has been widely acknowledged as more polarized and contentious than the Democratic Party primary race. In the current election cycle, many Republican Party voters demonstrate enthusiasm for candidate Trump as many Democratic Party voters demonstrate enthusiasm for candidate Sanders. Yet, the exit poll results for the Republican Party closely matched the final computer vote count for every candidate. This accuracy was obtained with about 500 fewer respondents than for the Democratic Party. The higher number of respondents in the Democratic race should lead to a smaller margin of error. The same exit poll for the Democratic race, however, conducted at the same time and the same places, differed widely from the final computer count and the margin of error for the exit poll. This difference turned a Sanders’ victory into a defeat. According to Klaus Pötzsch of the electoral committee responsible for the organization and running of any federal or EU election in Germany, after the decision by the Country’s highest court, every ballot is now hand-counted in public and read aloud. Germany is not alone among technologically advanced nations that reject computerized counting in their elections. Countries such as Canada, France, Ireland, Italy, Denmark, Finland and 53 other countries protect the integrity of their elections with hand-counted paper ballots. As the Massachusetts primaries indicate, the integrity of our elections will be always questionable and suspect until we join the many other countries that safeguard their elections with publicly observed hand counting of paper ballots. *As demographics alone may not explain the large discrepancy between the hand counted precincts and the computerized count of the rest of the state, the weighting factors applied to the Democratic Party exit poll may also be incorrect and even the exit poll underestimated Sanders’ win. The raw exit poll data, prior to their alteration with weighting factors, should be made available for forensic analysis (see e.g., paper published by the Shorenstein Center, Harvard Kennedy Center, p.19. Exit Polls: Better or Worse Since the 2000 Election?). The accuracy of the Republican Party exit polls suggests that the correct weighting factors were applied to the Republican electorate. This entry was posted in Election Integrity and tagged 2016 Democratic Party Primaries, 2016 elections., 2016 Republican Party Primaries, Election Fraud, Election Integrity, Exit Polls by Theodore de Macedo Soares. Bookmark the permalink. 8 Comments on "The Suspect Massachusetts 2016 Primary"
No twitter. Perhaps I should use it! Glad you like the posts, more coming next week. be honest but your bllgs really nice, keep iit up! This post talks about concerns with electronic voting machines but Massachusetts does not use these machines – Massachusetts has paper ballots that are counted by optical scanning. The post notes but should have further explored geographic differences in the state – Clinton’s greater strength in communities of color and urban areas vs. Sanders’ greater appeal to rural areas. Heather, optical scanner counts are driven by computer software and are not observable. These computer counts are then sent to computer software driven central tabulators. The only method that insures the integrity of elections is to have paper ballots counted by hand in full public view as Germany, France, Canada and many other countries do. One of the main points of this article is to point out that the unverified computer counts matched the exit polls for the Republican Party races but not for the Democratic Party race.